See more objects with the color darkslategrey rosybrown silver grey dimgrey or see all the colors for this object. This is a Textile. It is dated 1950s and we acquired it in 2005. Its medium is cotton and its technique is printed on plain weave. It is a part of the Textiles department. Little is known about such dress-weight cotton fabrics, as there are often no designer or manufacturer markings in the selvedges. They were probably intended for the home-sewing market. This fabric had been previously made up as a dirndl skirt; dirndl skirts require very little cutting, so there is a continuous length. 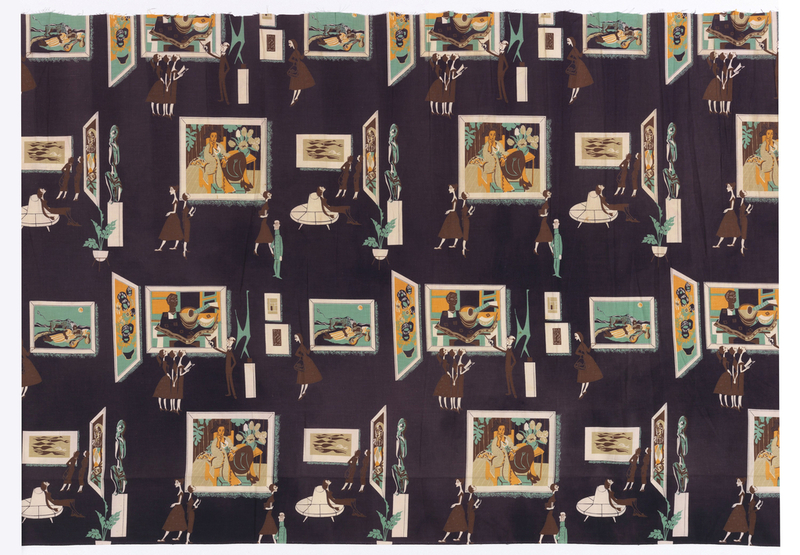 This particular pattern depicts fashionable ladies of the 1950s visiting a museum, perhaps MoMA in New York City: one of the artworks is recognizable as Henri Rousseau’s The Sleeping Gypsy (1897), which is in the collection of MoMA. The remaining works appear to be a vase with sunflowers by Vincent Van Gogh, a harlequin painting by Pablo Picasso, a portrait by Henri Matisse, a small canvas by Piet Mondrian, and a sculpture by Alexander Calder. These works, however, appear to be more generalized references rather than depictions of specific works. Although not categorized as a high-end fabric, the pattern is sophisticated and, together with 2005-32-1, provides a witty commentary on the cultural scene in the United States in the postwar years.